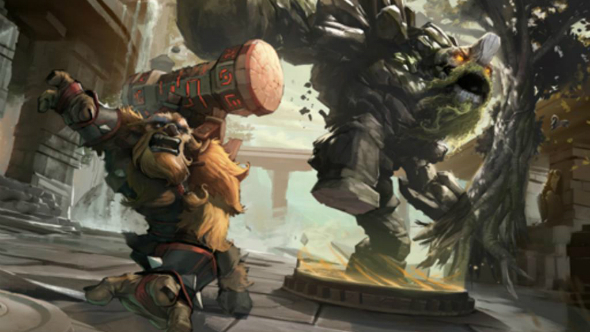 The world of Dota 2 custom games is as wide and diverse in quality as it is in content. Not everything can be what Dota once was, an entire new, hyper-popular genre built in a map editor, but that won’t stop the people from trying. But don’t be disheartened by that breadth of quality. We’ve delved into the Steam workshop to pull out the very best in new mini-games, twists on the normal formula and classic mods that harken back as far as Dota does. Below you’ll find our picks for what’s worth playing, from anime versus fighters to classic tower defence. 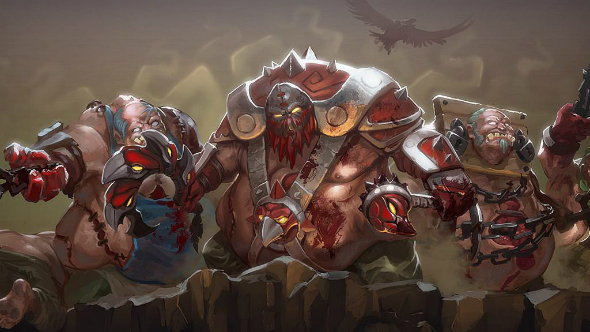 As for normal games, here’s the best Dota 2 heroes you can play today. Overthrow is your first port of call when checking out Dota’s custom games arcade. But it’s not just because of the patented Valve polish that the first custom game ever received, proving what the level editor can do. The game type itself is a nice breath of fresh air for anyone looking to play some classic Dota but without the possibility of being locked into another hour-long slog with people who don’t farm well. If you wanted something more cerebral out of Dota with more of a co-operative edge, then GemTD has you covered. As an old Warcraft III mod, like many others, the focus of this game is on tower defense (hence the TD). The towers you and up to three friends place around a flat area must kill the waves of evil couriers as they traverse a set path towards an icy cave. Any couriers you let through the cave after following their path will decrease your health. It sounds simple enough but, like Dota itself, has untold layers of complexity. The towers you place represent different gems – sapphire, topaz, etc – in varying qualities from chipped to perfect. These single towers can then be merged into more powerful ones with auras that help you kill more hardy couriers, such as magic-immune or flying. You place five gems between waves but only get to keep one tower, the others turn into impassible blocks which you can use to your advantage by creating a maze to prolong the couriers’ journey past your most powerful towers. It sounds a lot easier than it is, which is really saying something as we probably lost you three sentences ago. But, if you fancy testing your brain, this is one of the best tower defense games in the arcade. Colosseum is Valve’s second attempt to show off what can be done in their Hammer level design tool, and as usual it’s almost good enough to be a game of its own. Taking a bit of inspiration from Team Fortress 2 with a capture point style of game play, you face off against another team in a trap-filled gauntlet, attempting to push them back to their fountain. Originally made to celebrate Diretide, Dota’s version of Halloween, the Haunted Colosseum is now available all year round and plays a lot like the original Overthrow custom game in that it focuses squarely on fighting. The shifting battlefield between capture points helps break up the constant back and forth of fights though as each point has different traps to be wary of and ground elevations give advantages to defenders at key places. Even before Dota officially supported custom games, this was a popular mod that carried the slight risk of accidentally flagging your Steam account for a false-positive VAC. Now, without the need to tinker with packages or launch parameters, you too can send hooks into the aether hoping to land a friendly butcher. The hooks in Pudge Wars don’t quite behave like Pudge’s usual skillshot, allowing you to move around after the throw and create some bizarre looking curveballs. The aim is fairly simple and creates a lot of fun moments: kill the other team of pudges from the bad side of the river by pulling them over to your good side and punching them to death. Also, try to save your friends who get hooked onto their side, but that’s an ‘if you’ve got time’ sort of objective. There are quite a few variations on this theme, including the far more manic Dota WTF+, but Dota Imba seems to be a more consistently madcap experience. Again, another extremely simple theme taken to an enjoyable conclusion: all mana costs and cooldowns of hero spells are all but obliterated. Of course, that’s broken on some heroes more than others, so there’s a tiny bit of balancing, but for the most part this is completely imbalanced, hence the name. It’s more fun finding the unsuspecting heroes that do incredibly well without the constraints of the arcane laws, like a Crystal Maiden who can freeze five people in place and nuke them to pieces. 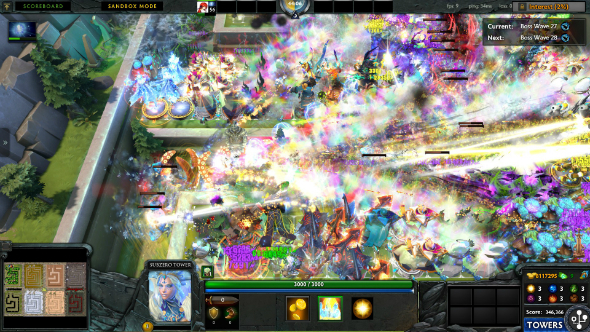 Frequently, games devolve into seeing who can be the biggest raid boss, amidst a mess of particle effects and death. 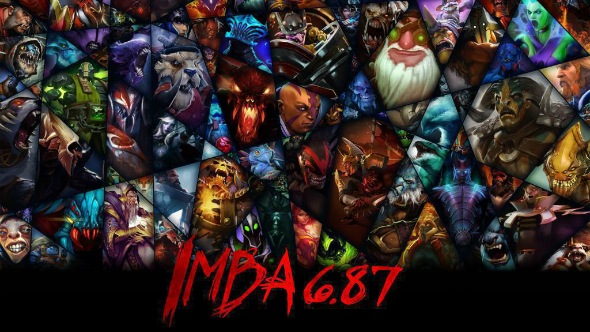 If Dota is best enjoyed responsibly, Imba is a funnel and a hosepipe. You may remember Dota Strikers being something of a soccer superstar when custom games first arrived, but development on the football-based brawl dried up last year. However Banjoball has stepped up in its place, offering a wider range of heroes to choose from to make your team of league-winning athletes. The game’s name is taken from the original Warcraft III map (where else?) that Dota Strikers itself spawned from. As with most football games, the idea is to put a ball in your opponent’s goal, but with the unique skills of Dota’s finest warriors things get a little weirder than Sunday league. Speaking of leagues, there’s a small informal one for Banjoball too, should you find yourself good enough to go pro. If you weren’t completely put off by the idea of GemTD earlier then there is another extremely well-developed tower defense game to try in Dota 2. Element TD finds its complexity not through various gems but by matching damage types to elemental armour or resistances. It follows a cyclical rock, paper, scissors style: light beats dark, which beats water, which beats fire, which beats grass, which beats earth, which beats light and so on. Each elemental tower can be combined with another to create dual or triple towers for more complex waves of enemies. The game’s proven very compelling with a spin-off mobile version available on Android and iOS already, but if you want to get the authentic Reborn experience, subscribe in the workshop. Want the best legally dubious unofficial anime game available through another game’s engine? 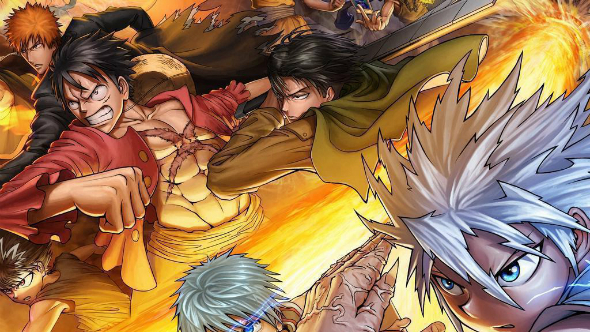 Bleach vs One Piece Reborn is the one. There are 37 characters from the popular series Bleach and One Piece to be chosen from in this arena deathmatch, with their own appropriate skillsets. A lot of them seem quite unbalanced, especially strength heroes, but the stages of gameplay are pretty different from a normal Dota game. Even if you’re not a huge fan of either series the way the arena splinters into different areas for different skill levels is a neat idea. Of course, this is an example of the sort of weird copyright-free zone that operates in the user-generated content of a game produced by a mod of a game using a user-generated map from another game. Dota 10v10 is that classic Dota experience turned up to 11. Or ten. No, definitely ten. It’s interesting how just teams twice the size alter the experience of a normal Dota match. No ability alteration. No mad meteors falling from the sky every 20 seconds. Just two times as many people as should be in your lane at any one time. Obviously things get bloody and messy and bloody messy a lot of the time, so games don’t last as long as the usual slog. 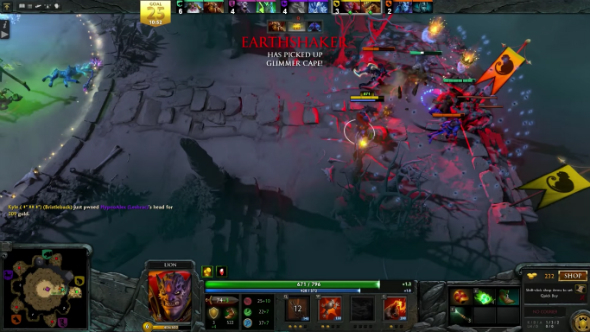 First introduced with an incredible all-star match at The International 2015, in which members of the audience filled out the remaining spots, a wide variation in skill sets doesn’t really affect the fun. With 20 people in a game there’s plenty of room for friends too, so it might be the sort of thing to bring a party into if a full game doesn’t appeal to everyone. There’s also a 10v10 option in Imba though so if you don’t even have time for this, then the direct train to crazy town is right there. While a lot of other custom games seem to stick quite closely to the design rules for Dota 2 as a MOBA, Roshpit Champions dares to reverse engineer a little bit. Returning more to the framework that Dota 2 was born from, a PvE RPG with skill trees and equipped items, Roshpit makes quite an unforgiving dungeon crawl for fans of the seemingly bygone ARTS genre. You’ll recognise heroes with the same models as those in the regular game, but the gameplay is far more like Diablo than Dota. Grab weapons, level them and yourself up by killing stuff, and prep to take on bosses with better gear and loot drops. Items have a lot of variety and depth, with runes built in and the skill trees and ability maps as complex as any MMO out there, so if that’s what got you into the small niche of Dota 2 then you’ll find a lot of fond memories on the common ground there. And that’s a wrap. If you know of any great Dota 2 custom games, be sure to let us know in the comments below, and we’ll be sure to take a look. What’s your favourite? Want more? 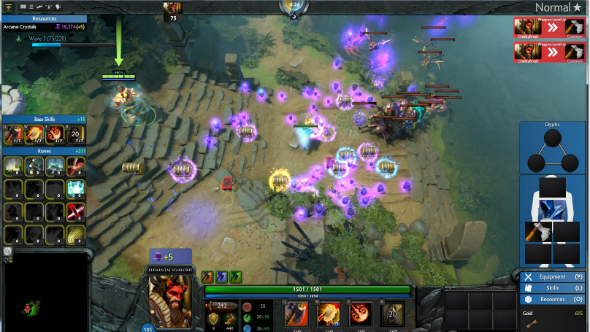 Here’s our Dota 2 review.